Disgraced African American St. Louis Police Lieutenant Carlo Gabriel wants fiercely to return to the headquarters hierarchy from which he has been exiled to the city’s tough North Side. All he needs do is track down the missing husband of the mayor’s vivacious press secretary. Instead he unwittingly and unwillingly unearths a morass of corruption, educational malpractice and greed that consigns thousands of at-risk youths to the mean streets of America’s erstwhile murder capital. Worse, it’s the kind of information that could get a cop killed. Fighting for life and his honor, Gabriel makes chilling discoveries that ultimately lead to a life-threatening and life-changing decision—a choice that could affect not only his own future but also that of the city and its top leaders. 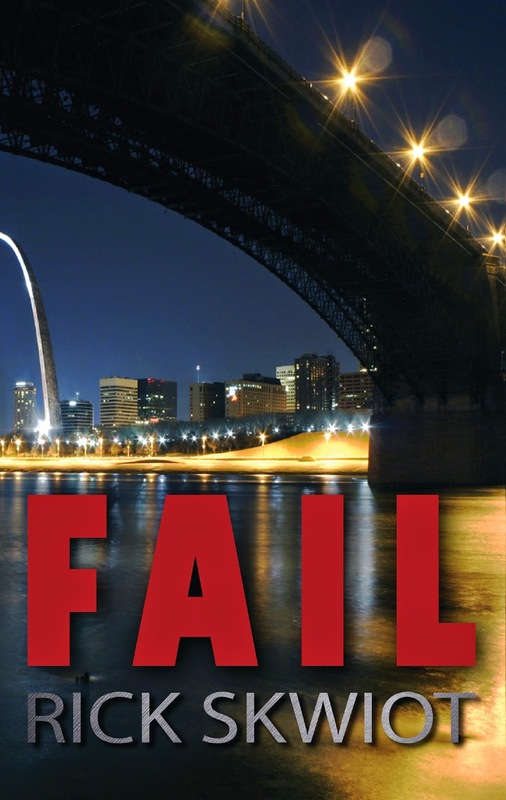 Fail is the first book by this author that I’ve read and now I’m a fan of Rick Skwiot. The book is packed with action, twists, and unusual characters that you wouldn’t think would mesh, but Skwiot makes it work and makes it interesting. I loved reading about the locations around the Mississippi River and the seedier side of the area. The characters were interesting and the story will keep you turning the pages, eager to find out how the story ends. The story had a message that no matter how bad things are, the can get better and I loved that, especially with the theme of the book. I hadn’t read a thriller/mystery in a while even though it’s my favorite genre, so this was a welcome read, especially since it was so good! Anyone who loves this type of book should find a copy. It’s a quick read but packed full of everything a mystery lover loves. This sounds like a powerfully written crime novel. Will add to my TBR stack, high though it may already be! Thanks for featuring this author and sharing your thoughts on his book with us. Thanks much, Vicki, for the thoughtful review and kind words about FAIL. I’m glad you connected with it and enjoyed it. Although set on the mean streets of St. Louis, the story could take place in most any American city. I’m pleased that it kept you turning the pages. Rick’s name is definitely one I should be adding to my own list. Your excellent review and great blog tour presentation, set me away to check out Rick’s site and other books, all of which seem to have achieved fantastic ratings and reviews over at Goodreads. It also seems a little ironic that the theme of this particular story involves young, at-risk people, being forced onto the streets of a US City, which meshes nicely with the storyline of the book I received this week. I shall probably finish reading ‘Noise’ first and depending how that goes, I’ll be off to download some of Rick’s books. Thanks for sharing your thoughts and I am pleased that you enjoyed ‘Fail’.